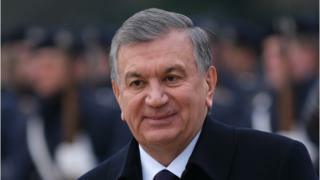 The president of Uzbekistan has demanded that police and military personnel lose weight. He made the remarks, reported on local news website Daryo.uz, on 1 March on a visit to the eastern city of Namangan. Urging overweight police officers and ministry of defence employees to slim down, he said: "We do not need an overweight officer or policeman. How can he catch a criminal in this condition?" He suggested that corpulent employees should take up sports to help them shed the pounds. "We will set a deadline of three or six months," he said. However, President Mirziyoyev did not say what would happen to those who didn't meet the deadline. The announcement provoked hilarity among some Facebook users in the country. "They would rather resign than lose weight," wrote one woman . "The easiest way is to ban them from tea houses, cafes and restaurants for three years," another person added. A user backing the remarks of the president said: "Public servants, you should lose excess weight, as well as your arrogance and cunning, then your job will be easier and more interesting". Half of Uzbekistan's population is overweight according to a report by national news agency UzA on 31 December. Citing the Uzbek health ministry, the report said Uzbeks' excessive weight was due to their sedentary lifestyles and unhealthy diets: "Forty-six per cent of people in the country have increased levels of cholesterol in their blood and 31% suffer from hypertension." The Uzbek leader's concern over the waistlines of public servants is shared with his counterpart in neighbouring Turkmenistan, where President Kurbanguly Berdymukhamedov has held fitness sessions for all of his ministers. Similarly the interior minister of Tajikistan, Ramazon Rahimzoda, urged his obese subordinates to lose their weight in 2017. Some Tajik police officers lost their job for not meeting weight requirements.